This article was originally posted on the Centric Consulting blog. #1 – When we talk about learning, people automatically default to their college degree and university education. What did you study in school and how does it correlate to your job today? Or does it? I studied Systems and Control Engineering in undergrad. My graduate degree was in Engineering Management – a blend of a Master of Science in Computer Engineering and an MBA. My senior project was building a climate model for the Aral Sea region in the former Soviet Union. While we didn’t use words like “machine learning” back then, it was essentially along those lines. So that certainly sparked my interest in that area. Machine Learning tools and models are much more sophisticated nowadays, but the fundamentals of understanding data and making decisions from it remains the same. I also minored in French. That hasn’t been very helpful in my career, other than a healthy appreciation for French cuisine! #2 – What type of continuing education or further education have you completed to keep your skills current in the marketplace? Every day I spend time working on a continuing education. I find massive open online courses – (MOOCs) to be extremely valuable. Recently, I finished a ten-course curriculum in Data Science, and now I’m doing a similar program for Artificial Intelligence. #3 – What book has taught you the most? What lesson did you take away from it? Surprisingly, the book that taught me the most wasn’t some bestselling business book or college textbook. Instead, it was a middle grades fiction story called Wonder by R.J. Palacio. The story centers on a child with major deformities and how he interacts with those around them. One of the central themes is “Be Kinder Than Necessary,” which is a personal mantra I have since adopted. It’s not always easy, but I find when I start with kindness I am more successful both personally and professionally. Make learning a priority! Making time for learning should be a line item on your daily to-do list, just like replying to email is. Read a lot, be it books, magazines or articles. And take classes – there are so many great options available nowadays for cheap or free. #5 – How have you made sure to continue your learning and development throughout your career? Do you have set daily or annual learning goals? I do set goals to keep myself accountable. I try to read 50 books a year, as well as finish one online class per month. #6 – What are you currently learning about right now, personally and professionally? Just recently, I got back into Machine Learning – including all things Cloud. So I am studying for my first AWS Cloud certification as well as working on my Microsoft Big Data Certification. Once those are complete, I’m hoping to do Andrew Ng’s Deep Learning course – I hear it’s great! #7 – What advice would you like to share with someone who would like to embark on a learning journey but isn’t sure how? Follow your passion. 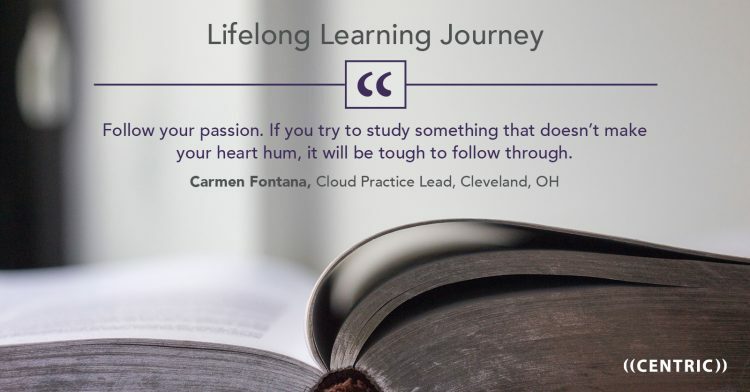 If you try to study something that doesn’t make your heart hum, it will be tough to follow through. And find the medium that best works for you. I hate classroom learning because I have a short attention span. But I love online classes because their lessons are short and I can watch them on the sidelines of my kids’ soccer practices!